The beauty businesses founded by Princess Marcella Borghese in the Fifties, Borghese, is aiming its new line of mud and sheet masks at a younger consumer as part of a turnaround effort. The new lineup is launching exclusively with Macy’s. 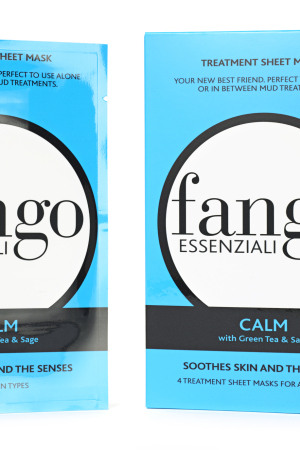 The collection, called Fango Essenziali, consists of four mud masks and four sheet masks called, Moisturize, Purify, Calm and Energize, which aim to provide the stated effects. The masks are sold on Macy’s Web site and will enter 150 Macy’s doors May 1. “What we see in beauty is that more and more, regardless of the retailer, products that serve the woman on the go are becoming more and more popular,” West said. In line with the company’s “Five minutes to wow” slogan, the products are designed to deliver results within five minutes. “The first time you use it you will feel the difference,” West said. The Moisturize mud mask contains olive and blood orange oils that aim to moisturize and balance the skin’s pH levels, and the corresponding sheet mask is infused with avocado, kelp and acai berry. Pink grapefruit and pink peppercorn are infused into the Purify mud mask, with lavender oil and arnica flower as the key ingredients to the sheet mask. The Calm mud mask is made with lavender extract and lemon seed extract; the sheet-mask version is infused with green tea and sage oils. Coffee seed oil, caffeine and activated charcoal are put into the Energy mud mask, while the sheet mask is infused with mango and pomegranate. Retail prices are set at $32.50 for the seven-ounce mud jars, and $7 for individual biocellulose sheet masks. Sheet mask four packs retail for $24.